A deliciously creamy strawberry frozen yogurt with only 6 ingredients that can be whipped together in minutes before adding to an ice cream maker! This frozen yogurt is the perfect avenue for all your favorite froyo toppings. We love adding fresh fruit to this strawberry frozen yogurt recipe! 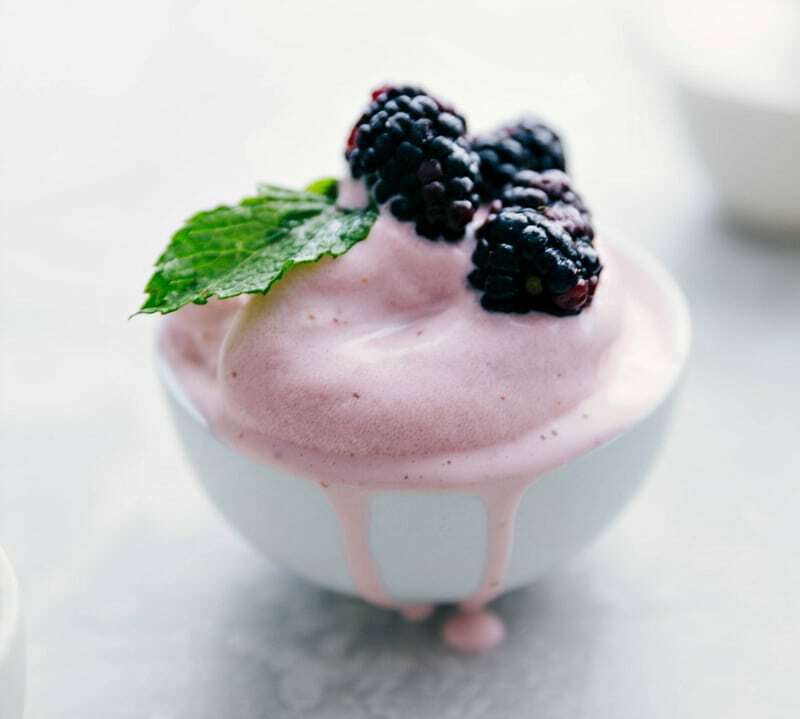 For a fun celebration with friends or family, pair this flavor with vanilla frozen yogurt and set out a bunch of fruit toppings for guests to pile on their bowl of frozen yogurt! 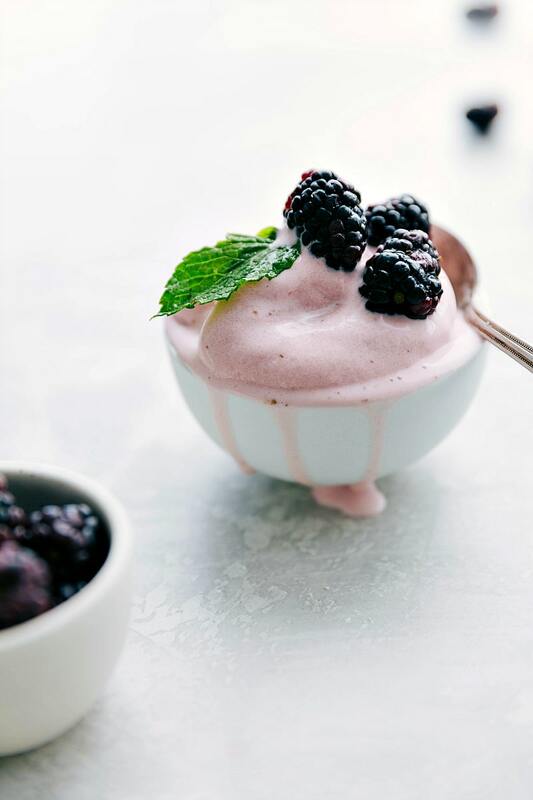 In a very large blender, combine all of the frozen yogurt ingredients. Blend until smooth. Pour into your ice cream maker and freeze according to maker's instructions. I love this recipe, Chelsea! I’ve tried making ice cream using similar ingredients, but never frozen yogurt, so I’m definitely trying this one out! Pinned! Haha love this frozen yogurt experiment you and your hubby had! Too bad his chocolate flavor didn’t turn out! But strawberry sounds dreamy! It’s funny that your husband ended up liking it. Sometimes it’s like people determine they don’t like something and then never have it again. I’m totally guilty of doing that lol! Thanks for sharing Chelsea! Awesome recipe!! What a fun summer dessert! Love the chocolate and strawberry combo! You make some fun food girl! Love this! Wow, this is such a fab idea, and I’m dying over the photos as usual! Love it, girl! Pinned! hahaha I hate when I try to convince my husband to eat something and then realize it’s not good after I’ve been talking it up : ) Ah well, it happens! This sounds amazing – chocolate and strawberry is the best combo. And gorgeous shots! Amen to that; summer, don’t go away! I would never guess this was made with froyo instead of ice cream and the chocolate covered strawberries and cones are beautiful! Homemade dipped cones! My kids would go crazy! Gotta try and pinned! These are SO pretty Chelsea! I love love love the strawberry/chocolate combo. So good! another great recipe! i can never pass up a good frozen yoghurt.. definitely brought back some childhood nostalgia. love it! These sound so good right about now! Oh heavens. Beauty! Almost too beautiful to eat, my friend! I’m so in the mood for something cool and creamy! What a fun idea!! 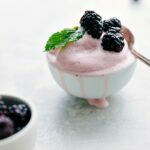 I love this twist on frozen yogurt! Such a great summertime treat! Oh, my gosh…why have I never thought of doing this?!?! Genius idea! Anything covered in dark chocolate gets a thumb up in my book! Your photos always make me want to dig right in to whatever you’ve made, too! Oh sweet mother of Pete, I want one of these cones right this minute! The chocolate shell is the perfect touch for this homemade fro yo!! 🙂 Pinned!